users to subscribe to upcoming posts and articles in their favorite readers. Social web applications such as Twitter, Tumblr or Instagram allow you to follow other users. Unfortunately, the subscribing experience is less than satisfying: it’s very hard for regular web users to subscribe to a feed in a reader. First, they have to find the feed on a page, then, once they read the cryptic XML code, they have to copy and paste the url into a reader of their choice. When we consider that most people don’t even know what a url is, we know that this experience will never be mainstream. On the other end, it is actually very easy to follow people on twitter or to follow new Tumblr blogs. We actually believe that these platforms are successful because it is indeed easy and works very well. But the ease comes from the fact that these platforms are centralized: you need to be a twitter user to subscribe to other twitter users. However, this has never been the web’s true spirit: you don’t need to be a gmail user to send an email to another gmail user. When we decided to tackle the subscribe problem we had to find a solution that embraced both the decentralized web that we love and the simplicity of a button that user could just click on. The approach we took decoupled the subscribing web applications from the publishing web application by using the browser and its localstorage as a middleman, with a set of redirects and iframes to send the subscriber to its favorite reader. When you click on the button above, your browser will load an iframe from Subtome, this iframe will extract your data from a localStorage instance with the list of your favorite subscribing applications. The iframe also keeps track of the page on which it was loaded. Eventually, when you select one of the apps, the browser opens a new window to it with the right information, and voilà! The implementation is actually surprisingly simple. When you click the button, the following code is loaded. It simply extracts the feed(s) and then loads an iframe which will show the user’s prefered services. The iframe url includes the feeds as well as the url of the page on which the button was clicked. The iframe is loaded from the subtome.com domain, which means it can access a dedicated localStorage instance for the user. The “reader” registration for a given user works using the same pattern: a hidden iframe is loaded and the information about that reader is stored in the user localStorage instance. Feel free to check the source code on the Github repository. Of course, some of you may be worried that this uses an app running at Subtome. This is perfectly right, except that this application is actually just a static HTML page running on amazon S3: there is no web application. Also, the full code is open source and public on github. Now, very recently, Firefox adopted Web Activities. Why couldn’t we use that? The first reason is that this spec was only implemented by Firefox, which cuts the rest of the web. The second reason is that we do not expect most readers to implement that yet. This means that there is a need for some kind of “shim” which can do that on their behalf for now! Interested by this? If you’re a publisher, the easiest thing you could do is start adding such a button to your site or your blog. Remember that people subscribed to your blog will tend to read your articles more and come back more often. If you’ve created a reader, you could maybe register with Subtome so that your users subscribe to content online more easily. It’s easy to do so! Finally, this is a very early stage project, you want to learn more, please check the Subtome website. We would love to get your feedback!. Superfeedr's tireless butler, assistant, confidant, and surrogate father figure. Great idea to make feeds much easier to add to your chosen reader, especially if using something web-based rather than a desktop app that can pick up on these things. Implemented on my site in about 3 minutes, take a look right at the top. Glad you liked it – thanks for trying! It’s been especially hard since Mozilla removed the RSS auto-discovery icon from the browser address bar! Sorry that you’re missing that. Personally, I liked it there, but it was decided to remove it. If a users previously had any live bookmarks then the new RSS button should have been added to their toolbar by default when they upgraded firefox. There is complexity but I must disagree with the description. Firefox lets me subscribe to a feed in 3 clicks (Live Bookmarks) or 4 clicks (google reader). It’s only complex because none of the browsers, besides Firefox afaik, have tried to make it easy. If in the early days browsers had made it possible/easier for web developers to just add an [a href=”feed://mysite.com/rss/”] big shiny button to our sites things would be very different today. It’s a step up, but it still requires three clicks. Does Google Reader have an API? 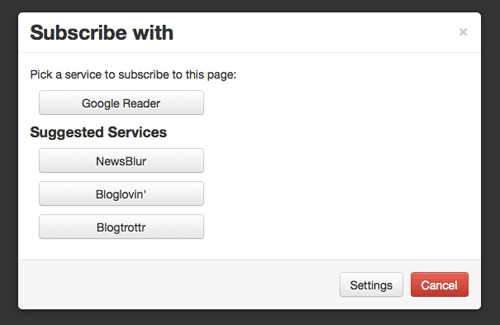 That would make one click subscribing on external blogs easier. Same for the other services. They’d have to be added manually, but you could always provide the URL in an input box to copy/paste in other readers. Well, we really do not want to use APIs, which are just adding coupling… when google reader will be deprecated all the integration work we’ve done will have been wasted, and if we ever don’t have enough time to keep working on SubToMe, new readers will not ever be able to be integrated easily. However, you’re right, we need to drop at least one more click. Were trying to add a “default” feature, where you can pick which reader to pick by default and be redirected to it right away. It would be great if this had some similar API that I could call from my instance of TT-RSS to add it to the list. We actually added the registerContentHandler, but we never found the right UI/UX for people who had no idea what a ContentHandler is, or evenwhat an RSS feed is. Reading the docs would have helped me there :) I followed the instructions, added the iframe to my self-hosted TT-RSS, and it worked! 1. Major browser makers like Chrome and Firefox are removing the once-ubiquitous button that alerted users that an RSS feed was present. Now, the onus is on the site developer to put an RSS button somwhere in the UI. This makes it much less likely that a user will discover feeds that they can subscribe to. 2. Most mainstream users don’t know what RSS is, and they don’t maintain an RSS reader. They are increasingly “subscribing” to content using content aggregation apps like Flipboard, G+, Facebook, Pinterest, etc. that each have their own non-standard scheme for “following” content. People just know that “all my feeds are in Flipboard” without knowing what’s going on behind the scenes. It seems to me that we need one “Subscribe” button that will seamlessly let clueless users follow your content on whichever aggregator they use, even if that means triggering a G+ “follow”, a Facebook “Like”, a Pinterest “pin” or whatever- behind the scenes. One of the key goals of the button is to hide “RSS” altogether. Most people don’t know what HTML is and yet are able to consume pages without caring much. We want to achieve the same: allow people to subscribe to pages without knowing about RSS at all. I agree with your statement about subscriptions thur Facebook , G+ and others, but you have to remember that these platforms are medium by themselves with their own agendas and criteria as to whether they should broadcast a message or not. SubToMe allows publishers to just free themselves from that constraint by allowing open readers. But you’re right, we hope to see a G+ or Flipboard of Facebook app plugged on top of SubToMe.